Swagtron is a name which needs no introduction. The company’s range of hoverboards has always been associated with quality, durability and style. 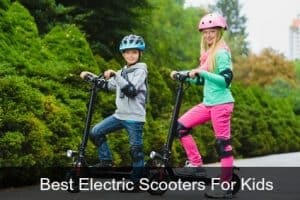 In fact, along with Razor, they were one of 2016’s most popular names in electric rideables, and continue to be this year. 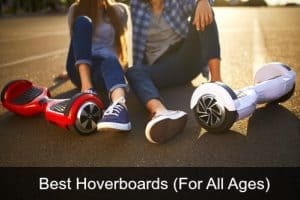 Their 2017 hoverboards include the Swagtron T6 off road hoverboard, the Swagtron T580 Bluetooth Hoverboard with App, and the new budget priced Swagtron T8 which we are going to discuss in this article. In this Swagtron T8 review you’ll find out whether or not this hoverboard is any good, and if it the one for you. 1 What do you get with this hoverboard? 2 What’s good about the Swagtron T8? 5 How does it compare to the other Swagtron hoverboards? What do you get with this hoverboard? What’s good about the Swagtron T8? The motorized wheels with hard rubber tires helps to ride on any surface easily over stable surfaces. This hoverboard is equipped with a battery pack that has Swagtron’s Sentry Shield technology for added fire safety. It is a light weight hoverboard and weighs only 24 lbs. Not suitable for people over 90 kgs or 200 lbs – this is slightly lower than the standard max weight of 220lbs. If you want a hoverboard suitable for all the family you need to take everyone’s weight into consideration. Long charging time of 5.5 hours. The average charging time for a hoverboard is about 2-3 hours. 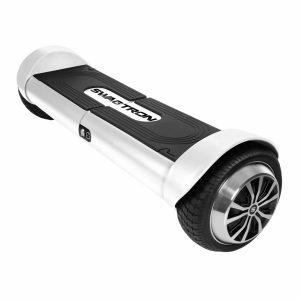 Shorter range per charge than some of the other Swagtron hoverboards. This travels about 5.8 miles on a single charge unlike the others which can travel between 7 and 12 miles per charge. Like all of Swagtron’s hoverboards, the T8 has been also been designed keeping in mind the UL certification guidelines and has full UL2272 certification. The UL Testing is known to be the best in the world. When a product passes this testing, it receives UL Certification for its authencity. The Underwriter Laboratories (UL) conducts a variety of rigorous tests on the samples sent. Only if the product passes each and every test is it even approved for further manufacturing and sale in the market. A holographic sticker is placed on every product as a proof that is UL certified – always look out for this when you’re buying electronic products. How does it compare to the other Swagtron hoverboards? Although this is a Swagtron T8 review, its still important to take a look at the other hoverboards in the Swagtron family. Right now they have 6 hoverboards on the market – the T1, T3 and T5 of 2016, and the T6, T580 and T8 all released in 2017. But how do they all compare? How do you choose which one is best for you? All are good hoverboards, but some have features that make them stand out from the rest. Want bluetooth and app connectivity? The Swagtron T3 and T580 are bluetooth hoverboards. As is the off road Swagtron T6. Need to save money – which is the cheapest option? This one is their cheapest hoverboard. Followed by the T5 entry level hoverboard from 2016. Want to travel over more than just the typical urban terrain? 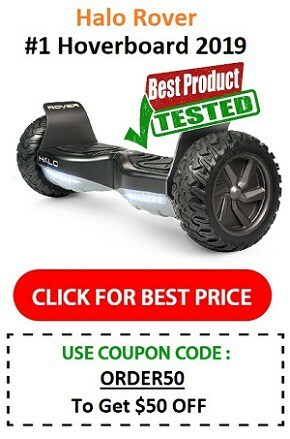 If you want to hit the grass, or ride over sand, gravel, other kinds of uneven ground, you’ll need an off road/all terrain hoverboard. Swagtron’s only off roader is the Swagtron T6. Don’t want to risk using a lithium ion battery? 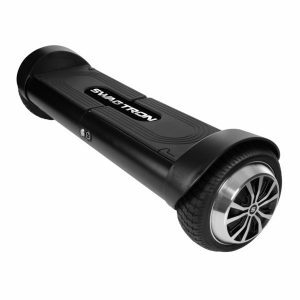 All Swagtron’s batteries are tested and UL certified, and also come with their patented Sentry Shield Technology. If you really don’t want to use lithium ion though the Swagtron T8 uses a lead acid battery – one of the first hoverboards on the market to do so. Which is the fastest hoverboard? 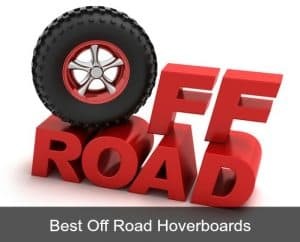 Their off road hoverboard travels at up to 12mph while the others (the non off road hoverboards) have a speed of between 7 and 8mph. It is also the strongest with the most powerful motor and longest range per charge. Which is the most popular right now? Last year the Swagtron T1 and T5 were the most popular, but right now 2018’s Swagtron T580 is flying off the virtual shelves – it has bluetooth, app connectivity and is CHEAPER than the two models that came before. All in all, you can see from our review that this is indeed a good choice for anyone looking for a budget hoverboard, and likes the new modern design. The Swagtron T8 is not the best of Swagtron’s hoverboards, but some people will like the fact that it doesn’t contain a lithium ion battery (which caused problems in some earlier, uncertified hoverboard models). Also the price is definitely a big selling point – right now its priced at just $148.00 on Amazon Its start up balancing feature will be good for beginners or kids as it makes it safer to get on and off the board without falling off! Bear in mind that it does have a few negatives though – a lower than average max weight of 200lbs and a longer charging time of 5.5 hours. And of course at this price point you won’t get any of the usual bells and whistles like bluetooth or app connectivity. If you can deal with that though (if you’re buying for a kid they probably won’t care about the extras!) then this is a good investment and worth a try.